If you had to make a promise or drink a toast to water, what would it be? Between 9th and 13th May 2016, I’ll be walking from the Dŵr Cymru water treatment works at Bontgoch to the Cyfoeth Naturiol Cymru visitor centre at Ynyslas, pacing out the entire network of mains water pipes that lie in between. The route will take me along footpaths, main roads and lanes, over streams and rivers, through a wind farm and past a peat bog. I will walk through Bow Street, Rhydypennau, Dole, Llandre, Dolybont, Talybont, Tre’r-ddol and Borth. I’ll be carrying a 2 m length of blue water pipe and a bottle of freshly-treated tap water, collected from the nearest house to the water treatment works, and two glasses. I will invite the people I meet make a promise of one thing they could do to ‘treat’ water differently in future: for a day, a week, a month or the rest of their lives. Their promise will be written on the pipe for me to carry onwards to the next encounter. Then, holding and filling our glasses, we will drink a toast* to water and to their promise… Stopping off along the way to ask if I can refill my water bottle, I hope to meet curiosity and kindness, enjoy conversation, dissolve consternation and carry an uninterrupted flow of water treatment promises, from the hills to the sea. 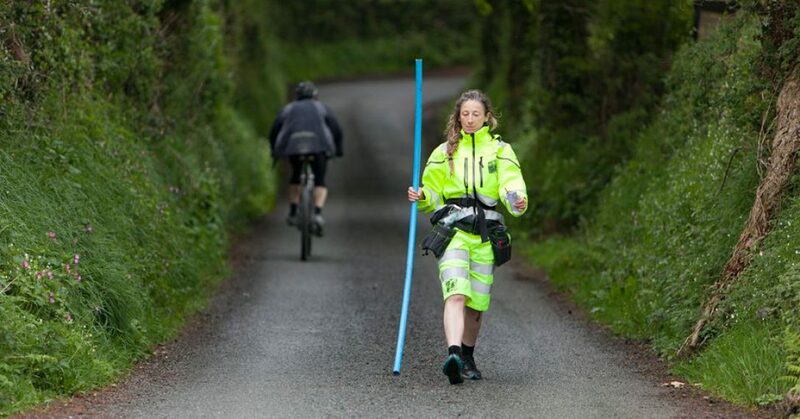 Water Treatment Walks is a commission for the spring season – Y Gwanwyn – of Cymerau: a project operating in Ceredigion and using participatory art practices to test new ways of working together to address contemporary water issues. Cymerau is part of the wider AHRC Hydrocitizenship research project. * Superstition has it that toasting with water is bad luck. Pah! I propose a toast: we should reclaim that tradition and raise a glass of water… to water. It’s essential to life, after all.